Those gorgeous fish cakes at my local market have increased from $6 to $9 in the last couple of years, making them a bit too pricy for our family. However! 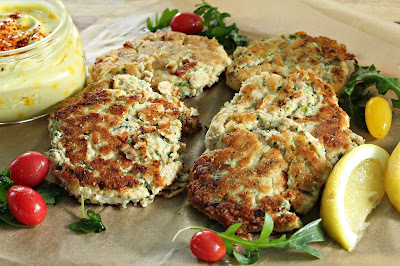 For a few dollars more than the cost of one thick salmon cake, I recently purchased enough ingredients to make eight thinner burgers - and got a tip from the fishmonger as to how to prepare them. Just six healthy ingredients were used in this recipe from Time Magazine's Health Food website. While the patties were a bit tricky to keep together when turning over, it didn't matter a bit to the light, fresh, flavorful taste. Enjoy these salmon burgers with "Ugly Delicious" Twice-Baked Veggie Fries and/or Le Grand (Saffron) Aioli. A good source of omega 3's, they are packed with protein and will keep you full for hours! 1. Cut the salmon in 1 1/2" chunks. Add to food processor and process for about 10 seconds. Remove salmon to a large mixing bowl. Note: This was the tip from the fishmonger: remove the salmon before you add the other ingredients in the blender otherwise the fish will turn to mush. 2. Next, to the food processor, add the parsley, chopped onions, lemon zest and juice, egg and salt and pepper. Mix until combined. 3. Add the mixture in the food process to the salmon in the bowl. Mix with a spoon or your hands. 4. Put the almond meal in a medium bowl. Take a handful of the salmon mixture, and roll it in the almond meal to coat it. Form a patty, and set aside on a plate. Makes about 8 patties. Put in fridge for about 15 minutes to 1 hour to firm up. 5. Heat 1 tablespoon of the oil in a cast iron frying pan (preferably). When the oil is hot, cover the bottom of the pan with the patties. Cook for about 3 minutes per side. Flip them with a spatula carefully; if they fall apart, reform the patty with the spatula. 6. Remove the cooked burgers to a serving plate, and finish cooking the rest of the patties. Serve with lemon slices, salad, fries, or a condiment. The patties are perfect cold for leftovers the next day. Recipe adapted from Time website here.